ANKARA-BERLIN, (SANA) _ His Excellency President Bashar Al-Assad reiterated that the occupation is the sole reason hindering the realization of Mideast Peace. In a joint interview with the Turkish ' Hurriyet' and the German 'Bild' dailies, President Al-Assad pointed out that there is no Israeli partner to make peace and the Israelis are not ready to hold peace negotiations. President Al-Assad added that the issue of peace is not a Syrian- Israeli one, but rather the realization of the peace in the entire region, asserting the necessity for Israel's implementation of all the United Nations Security Council resolutions and returning the occupied territories to their owners. President Al-Assad underscored that all have the right to defend their land and that Syria will continue supporting the resistance as long as it continues its resistance to restore the rights and the land. His Excellency the president made it clear that wars always create the more of terrorism, and that no war can protect the West, which is to be protected by balanced policy, economic growth and helping others in development, education and culture. President Al-Assad described the role played by Turkey as 'important' in creating a ' sort of balance' in the region, calling on the European Union to work for Turkey's joining the EU, because it needs Turkey as an Islamic Country as not to be changed into a Christian club. Regarding Syria's evaluation of the absence of peace in the region for hundreds of years, President Al-Assad said "There is one reason preventing the achievement of peace, which is occupation… So, occupation is the cause of all wars… first the English, then the French, and now Israel." On the changes needed to achieve peace in the region, President Al-Assad said "In short, Israel must apply all the UN Security Council resolutions and return the occupied lands to our people." Regarding the difference between the Syrian stance and the Iranian one on acknowledging the existence of Israel, President Al-Assad said "In fact, during the talks we held in Turkey two years ago, the Iranians expressed their stance very clearly and affirmed that there are no points of disagreement between them and Syria regarding achieving peace in the region… we may differ in some details, but in general there is no disagreement in opinion between the two countries." 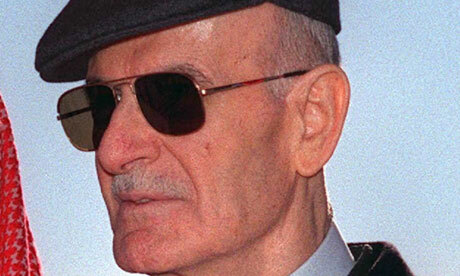 On the possibility of Israel resorting one day to dividing Jerusalem as capital of Palestine, President Al-Assad said "According to what we're hearing, No… the Israelis always insist that Jerusalem is their only capital in a way that accepts no sharing… they speak about Jerusalem as a whole, while the Arabs insist on East Jerusalem being the capital of Palestine." 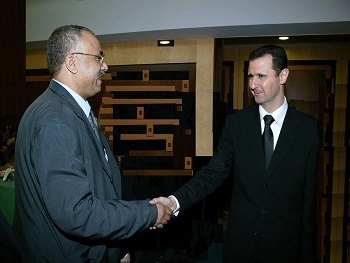 Regarding the existence of secret talks between Syria and Israel and the possibility of reaching a peace agreement, His Excellency said "We always express our opinion clearly and publicly and affirm that we want peace and the agreement… but we cannot achieve this only from one side, and the other side must participate… until now, there is no partner of this kind. The result is that the Israelis chose a government that advocates extremism, and this government doesn't bring peace." "The question that must be posed is whether the Israeli people will work to change this image or not… we don't know. There are no talks now between Syria and Israel… the Israelis aren't ready to hold any negotiations and don't want to resume any negotiations." London, (SANA) – President Bashar Al-Assad said that inter-Arab relations require bilateral relations, coordination in various fields, and reflecting these relations on existing issues to improve the Arab situation. In an interview with Al-Hayat Newspaper published on Tuesday, President Al-Assad pointed out that there is currently a new Middle East that has more awareness on the public level that adheres to resistance as a right to defend countries and rights, in addition to being aware of the necessity of good relations among other nationalities in our region. President Al-Assad expressed hope for forming an Iraqi national unity government as soon as possible, one that includes all forces and is capable of protecting Iraq's unity and stability, establishing good relations with neighboring countries, and limiting reliance on the US presence in order to reach its complete withdrawal from Iraq. His Excellency warned against the vacuum in Iraq, noting that every day that a vacuum exists will cost more as time goes by, affirming that Syria stands at equal distance from all Iraqi sides and is against all separatist forces. 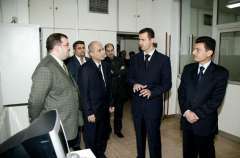 President Al-Assad said that Syrian-Lebanese relations are developing well on official levels and that they require further development, voicing concern over the situation in Lebanon and any conflict that may cause damage to it, calling on all Lebanese political forces to maintain constant dialogue and communication. He affirmed that Syria's known stance towards the resistance is non-debatable and clear-cut, and that any meeting must be based on the stance towards resistance as a principle. President Al-Assad described the Syrian-Saudi relations as good and stable, adding that the basic guarantee for this relation is the direct relation between President Al-Assad and King Abdullah bin Abdul Aziz of Saudi Arabia. President Al-Assad said that weakness of the Arab role leaves vacuum which allows others to intervene in the Arab issues, and Arabs must criticize their own absence rather than criticizing the absence of other roles. President Al-Assad added that the Syrian dialogue with Iran and Turkey is easy because it stems from logical thinking despite the difference of the geographical angles, pointing out to the distinguished Syrian-Turkish relations in the few last years in addition to the already-excellent relations between Syria and Iran. On Syria's concerns with regard to fragility of the Arab situation, President Al-Assad said "We, in Syria, think that if someone is not fragile but lives in fragile surroundings and lives in a state of waiting for the situation to change, then this is unrealistic. Fragility is a contagious process, and subsequently no matter how good your situation is in your country while you are in a state of interaction with those around you, then the result is that your country will be affected and will become fragile also." 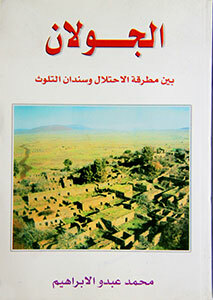 "All problems around us whether security, sectarian or political instability in the general meaning will reach us… so we transfer this concern to positive one by an effective work to change this fragile state around us to a positive state or at least try to reduce its damage… the Syrian move stems from the concern about the surrounding status," President Al-Assad added. DAMASCUS, (SANA)-President Bashar Al-Assad said that it was hard to imagine that the level of Syrian-Turkish relations would reach their current strategic level in such a short time, but that there was a vision that this was possible for a simple reason, which is that the Turkish-Arab relation is one of fraternity, saying "we lived for hundreds of years in one state, and before the Ottoman state we lived in an Arab state and other different ages and stages… we were always together." In an interview with the Turkish Arabic-speaking TRT TV satellite station broadcast Wednesday, President Al-Assad said that this relation is a natural human relation that underwent conditions that weren't good for less than a century – around 80 years – and this period cannot replace the entire history of the relation that spans many centuries, adding "it is natural to have confidence and faith that you will reach this level… if we didn't have this confidence we wouldn't have reached it… we cannot arrive by chance. 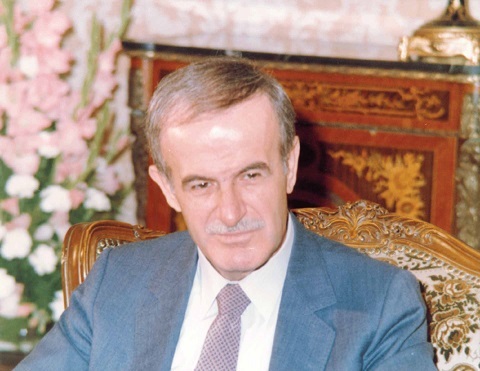 "So, yes, we had a vision in this direction, but in fact we are surprised by time… I believe the time was due to the popular enthusiasm more than government performance… if we didn't have a strong popular base in Syria and you had the same in Turkey, it wouldn't have been possible for this to be achieved," President Al-Assad explained, noting that movement across the borders and the flow of goods in both directions increased last year after canceling visas and singing the free trade agreement. "There is very great momentum and acceleration… so we can say that yes, we expected this, but we're very glad that the time was less than expected," he added. His Excellency said that the secret behind the realization of the Syrian-Turkish bilateral agreements has two sides; the first one is the aforementioned popular enthusiasm, the similar sentiments and traditions, and mutual issues, pointing out that many families in Syria are of Turkish descent and vice versa. Question: What has that raid on the flotilla done to the atmosphere in the region? President Bashar Al-Assad: Destroyed any chance for peace in the near future .Very simply, in a very simple way, mainly because it proved that this government is another pyromaniac government, and we cannot achieve peace with such government. Second because they attacked a Turkish aid. The Turks never attacked Israel; never smuggled weapons; never did anything harmful to Israel. They only work for peace, especially during the last few years, and they were the only mediator in the meantime and the relation between Turkey and Israel has deteriorated because of this raid. Question: The Turks are mediating between Syria and Israel, Are you saying now there is no chance of that to happen? President Bashar Al-Assad: In the near future, I don't think there is any chance unless they change their behavior. 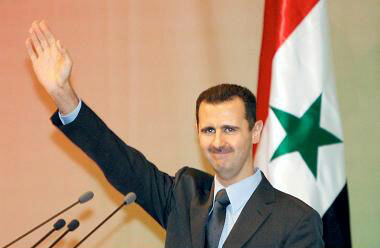 President Bashar Al-Assad: The Israeli government behavior. Question: Do you believe you have a partner you can do business with? President Bashar Al-Assad: No, no Definitely, We don't have a partner; we know this even when we went to peace; we never believed we have a partner. We have to try. In peace we keep trying. But with this government, it is something different from any previous Israeli government. Question: You talked in the past about the danger of no- peace- no -war and suggesting that if you don’t have peace, you might have war, so are you saying that, because of the flotilla and what happened in the raid the risks of war have increased in the region? President Bashar Al-Assad: Definitely, definitely before the raid, the raid, it showed this danger; but realistically we have this danger before the raid, because we have many other evidences about the intentions of this government, about the intentions towards peace, about the intentions towards the Palestinians, the intentions to kill Palestinians; this is enough to talk about danger of having war in the region. Question: Now every year about this time of the year, and in the last few years anyway; there have been talks about war in the region, do you think that it is serious? 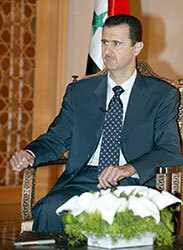 President Bashar Al-Assad: It is more serious. As I said previously, if you don’t have peace, you will have war someday, when? Nobody knows. But when you will have war, it will start suddenly. We cannot expect or read exactly when and how. So, when you don’t have peace you have to expect war everyday and this is very dangerous. Question: Why not have a Sadat's style visit to Jerusalem? Why don't take matters into Iran's hands and say I want peace in this region, and I'm prepared to come to your capita or the city you call your capital to make that peace to try to make it happen? President Bashar Al-Assad: Because peace is not about visits; is not about protocol or official visits. It is about the will; when you don't have a partner, you don't waste your time with these actions. So we have to be realistic. 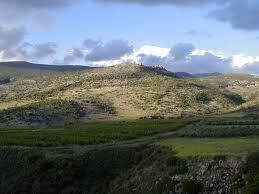 It is about the land; it is about Israel withdrawing from our occupied land.